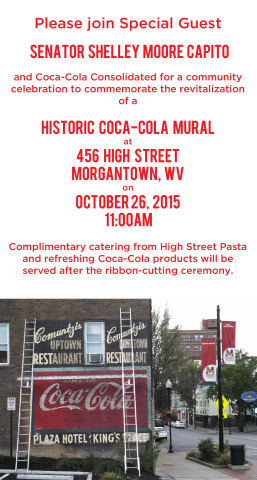 Coca-Cola to Unveil Restored Historic Wall Mural in Celebration October 26; All Invited! have become faded ‘ghost signs’. products! The event is free and open to the public. Statler and Delegate Brian Kurcuba will join the event as special guests. commemoration,” said Kay Marie Comuntzis-Getsinger. ghost signs over the last three years. Southeast, with corporate offices located in Charlotte, North Carolina. CCBCC stock is traded on the NASDAQ exchange under the symbol COKE.